With the latest Mac OS X macOS Sierra released in 2016, many users still regard Mac OS X Yosemite as the best Mac operating system ever, coming with various amazing features and apps. With such an attractive Mac operating system, many users, however, face a setback when they want to download music on Yosemite: they can't find a music downloader which can work well under Yosemite. 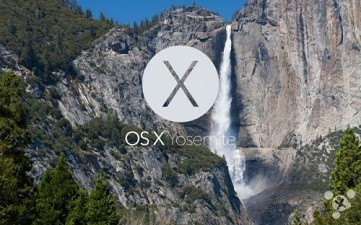 Those programs they used before all crash or breakdown when it comes to the latest Mac operating system. To help users smoothly download music on Yosemite, we choose top three best MP3 music downloading software for Yosemite on the market. MacX Video Converter Pro is a video converter especially working under Mac OS X which is packed with 320+ video and 50+ audio codecs. This tool pairs easy-to-use controls with functionality. It can smoothly work under the latest Mac OS X 10.10 Yosemite (and also OS X 10.11 El Capitan, macOS Sierra) to not only successfully download and record online videos, but to convert the downloaded and recorded video to any video formats including MP4, MOV, FLV, WMV, AVI, MKV etc and audio formats, like YouTube to MP3, AAC, AC3, WMA, AIFF, iPhone Ringtone, etc. What's more, the files can also be transferred to various mobile devices, iPhone, iPad, Andriod etc. It's great to download music or stream muisc with best music streaming service, it depends on you. Jaksta Media Recorder for Mac is capable of recording and downloading music files on Mac OS X Yosemite. There are several but not comprehensive formats available for you to select from. The option of having items automatically added to your free iTunes music is particularly nice. Jaksta Media Recorder for Mac is overall a good downloader for those to easily download MP4 music as well as MP3 audio song files from sites such as YouTube and Vimeo. It however falls a little short in terms of compatibility and comprehensive solution. 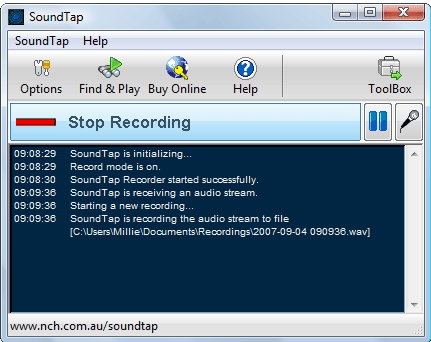 SoundTap Streaming Audio Recorder is an easy to use tool for the users who want to record the sound being played through their computer. It allows you to capture the audio, be it a radio broadcast or a movie soundtrack and save it locally as MP3 or WAV files. SoundTap Streaming Audio Recorder is also widely used to record internet radio webcast, save streaming audio broadcasts, record audio conferences, record VoIP phone calls, or convert audio from other formats. But the output audio quality may be not as good as what from top legal music download sites. Summary: Obviously, MacX Video Converter Pro comes with cheaper price while offering much more comprehensive features, in consideration of the fact that it's a combination of video downloader, video converter, screen recorder, slideshow maker and video editor with which more of your needs can be satisfied. Now an easy conclusion can be drawn that MacX Video Converter Pro is the most effective solution, both functionally and economically. Below are the detailed steps on how to download free music on Mac OS X 10.10 with ease. There are two ways: extract music from downloaded online videos or recorded videos. As YouTube has long been the most popular platform for users to enjoy music, to exact audio from YouTube means you can own rich music resource, and this is where MacX Video Converter Pro excels. This music downloader for Mac works as an excellent YouTube audio converter, which is professional in extracting music from various YouTube videos, be them SD videos, HD video and even 4K UHD videos in a few clicks. Step 1: Hit "YouTube" and click "analyze" to load the YouTube video details by copying and pasting the video URL. Or clicking "paste & analyze" button to automatically detect the YouTube videos on the opening website page. Note: You can freely download any music video or songs as you like. Step 2: To extract audio from downloaded YouTube videos, simply choose an audio format under "to Music" as the output format. Step 3: Click "Browse" to set the folder to put the downloaded file. Following the above steps, click "RUN" button to start to download music in 4K on Mac. Featuring a screen recorder, this Mac music downloader has a knack for capturing anything shown on Mac screen, which allows you to alternatively capture any video from non-downloadable websites like HULU, BBC, etc and convert them to audio formats. All you need is to open the videos and let the music play. Run this screen recorder and click "Screen Recorder" button. Then click the "Target Folder" button and choose the location to save your recorded files. Hit "Start Record" button, the program will start to record screen on Mac. Tips: The recorded file can be stored as AAC. For those who needs more formats, just follow the step below. After the recording, just convert the output file to the audio format you want on Mac as the steps to convert video above. A great collections of the ultimate apps to download free music on iPhone, iPad, iPod, Android and Mac/PC in mp3, mp4 for limitlessly offline playback. Can't download music torrents free? This music torrents download guide centers on how to download free MP3, MP4, MKV, etc. music torrents from top torrent sites as well as convert torrent to iPad iPhone Android. This page rounds up the best YouTube downloader for Mac with rigorous tests on speed, safety, easiness, etc, and shares tutorials about how to download YouTube videos on Mac, convert YouTube to MP3, MP4, iPhone iPad, Android, etc. All about YouTube offline download on your Mac OS X.
MacX Video Converter Pro is the best Music Downloader for Mac which can easily download music with original quality and fast speed. This feature-rich video downloader also can help you download 8K/4K UHD full movie/videos/music free from other 300+ online sites.